NEW Watch Dr. Ciaccio’s presentation in VR below! Bio: Dr. Ciaccio is a Sr. Scientist working in Formulation Development at BioMarin Pharmaceutical, Inc. in Novato, Ca. Prior to joining BioMarin, Dr. Ciaccio completed her Postdoctoral training in the Department of Bioengineering and Therapeutic Sciences at the University of California San Francisco, where she explored the application of drug delivery technologies for sustained release of biologics. Previously, Dr. Ciaccio obtained her PhD in Pharmaceutical Chemistry from the University of Kansas, where she investigated mechanisms of protein degradation and aggregation. She obtained her BS in Pharmacy from Purdue University and spent three years working in Quality Control at Eli Lilly and Co., supporting insulin manufacturing prior to attending graduate school. Watch Dr. Ciaccio’s presentation in Virtual Reality (VR) below! Use your keyboard arrows or click and drag to visit the Marin Science Seminar classroom. Dr. Tesla Monson studies mammals, especially their skulls and teeth. She is a researcher at UC Berkeley and has a BA in cultural anthropology, an MA in biological anthropology, and PhD in Integrative Biology. 1. What made you want to study mammals? Growing up in Washington State, I was always really interested in biological life, and particularly animals and plants. When I first learned about Paleolithic cave art in my undergraduate anthropology class, which is some of the oldest and most beautiful art, dated to more than 30,000 years ago, I became fascinated with the seemingly timeless question, “What makes us human?”, “What makes me, me?, “What makes humans unique from other animals?” And “What makes non-human animals different from each other?” Because these questions are focused on trying to place humans within the context of evolution and life on this planet, and because humans are mammals, I have been studying mammals ever since. But it doesn’t seem out of the realm of possibility that I will expand to other groups of living organisms within my career (such as birds, or even plants), because the same basic principles of evolution guide all life as we know it, mammalian and otherwise. 2. What are the best parts of your job? There are many parts of my job that I love a lot. I love being able to travel all over the world to look at museum collections and share my research at conferences. I love collaborating with scientists, and being able to share my work with students and interested parties of all ages. And I definitely love the feeling of holding a multi-million year old fossil in my hand. But I think the best part of my job is being able to spend my days researching, and studying, and trying to answer questions that no one has ever answered before. There is no greater feeling than the feeling of discovery, that I have uncovered something, or shown evidence for something that no one else in the history of the world has ever shown. I love being able to use my brain every day to ask questions that interest me, not for money or for fame (because there’s not a lot of that in science), but because I am truly interested. For me, the best part of my job is getting to spend every day thinking with a free mind and a brain that belongs exclusively to me, and getting to contribute new information to the world, and to science, as I go. 3. What are the worst parts of your job? There are many different aspects of hardship in science. I think that one of the worst things about my job right now is seeing how science, education, knowledge, and facts are under attack on a daily basis, not only from the general public but also from our government. This is extremely disheartening, but it makes what I do even more important, and it makes sharing that science with the public particularly crucial. One of the other worst things about my job is seeing how people of color, and women, and people from diverse backgrounds, have to face bias and discrimination in science, and in academia in general. Many studies have shown that having diversity in science only contributes to the overall quality of the science that gets done, and makes the science and the learning process better. We need more role models in science that come from diverse backgrounds and are invested in recruiting and training new generations of scientists that further contribute to that diversity. And we need to support our scientists from diverse backgrounds as they progress through their careers, because it’s always harder to do something when you are one of the first to do it. Again, that’s another reason that I feel that public outreach, and giving public lectures, and showing up as a role model, are so important. 4. What does it mean to be a scientist? This is a great question, and one that I am still not sure I know the answer to. I used to think that being a scientist meant doing research, and publishing, and that was it. But now I know that being a scientist goes so far beyond that. As I mentioned before, there are many hardships and obstacles in science, and some of those adversely affect some groups more than others. So I think that a big part of being a scientist is being committed to improving the discipline, through maintaining strong scientific ethics and integrity in science, and through recruiting new generations of people from diverse backgrounds into science. I also think that being able to communicate science to people outside of the discipline, whether they are other researchers, or just interested members of the public, it is a very important part of what it means to be a scientist. To this end, I have hosted and produced a radio talk on graduate student research, science communication, and the importance of diversity in science, that has been broadcasting for the last four years on KALX 90.7 FM in Berkeley and is available as a podcast. I am currently training new students to take over the radio program (The Graduates on KALX 90.7 FM), and I look forward to seeing how the new broadcasters develop as scientists and science communicators as they take over the show. 5. What current research are you working on? My current research focuses on understanding the evolution of the skull and teeth in mammals, and particularly in primates. As I will talk about in my lecture, teeth are extremely important for all mammals, not only because they are essential for diet and what we eat, but also because they play important roles in behavior, health, and they are well-preserved in the fossil record. The skull is also very important because it contains the majority of our sensory organs (eyes, nose, ears, mouth), and one of the most important parts of any vertebrate, the brain. To conduct this research, I travel to museums across the United States and in Africa to look at museum collections of extant (recently living) and fossil mammals. I measure the skulls and teeth of these animals and use statistical analysis to better characterize how animals look different from each other, with the goal of understanding how variation evolved in mammals over the last 60 million years. Want to learn more about Tesla Monson and mammals? Join us on Wednesday, February 28, 2018 at Terra Linda High School from 7:30 PM – 8:30 PM in Room 207! Eric Engh, an insect ID Specialist, works for the Marin-Sonoma Mosquito Vector. He also runs educational programs for the Marin-Sonoma Mosquito Vector. He has a Bachelor’s degree in Environmental Studies and an M.S. in Entomology from University of Florida. 1. What made you want to study insects? I have been interested in insects ever since I was a small child. I was also really lucky to have an excellent mentor- Ron Keith. He was our Vector Ecologist for Marin/Sonoma Mosquito and Vector Control District for over 30 years. Not only did he teach me much about entomology, he excelled at explaining information in a friendly and simple manner without making the listener(s) feel stupid. In the 5 years that I got to work with him, I got to see him help hundreds of people with their entomological inquiries. 2. What are the best parts of your job? What are the worst? I don’t really have any complaints about my job. I enjoy teaching about entomology, developing curriculum and interactive displays for public events, and I really enjoy being a resource of information for the public. The most difficult part of my job has to do with people who are convinced that some unseen insect is biting/infesting them, but there is no concrete evidence to support this. There are many causes of skin irritation similar to an insect bite that include but are not limited to: environmental sensitivities, allergies, reactions to various chemicals or medications, mental conditions, etc.. These cases can be very difficult because the person is absolutely convinced they have an insect infestation, and they often have already been turned away by doctors, family members etc., and are extremely frustrated. I can identify insects, but in these cases there is little I can do to help, and resources available for people with these problems are scarce. 3. 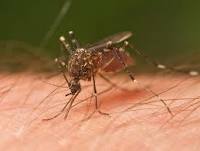 How can people protect themselves from being bit by mosquitos? Wear EPA approved mosquito repellent while spending time in areas where mosquitoes are present.Search around your home for any source of still water where mosquitoes may breed. Dump out small amounts of water that accumulate in items that don’t require water (buckets, toys, junk, etc. ), rinse out items that require small amounts of water (bird baths, pet water dishes, etc.) at least once a week. Don’t ignore mosquito problems! 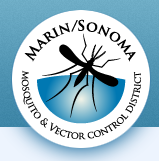 Call the Marin/Sonoma Mosquito and Vector Control District for help locating unknown sources of mosquitoes or to help with a mosquito-related problem that you cannot resolve on your own. 4. What should people do if they get bit by a mosquito? The most important thing to do is to not make the problem worse by itching the bite site and scratching open the skin, which invites infection. There are over-the-counter products that are commonly available to help reduce itching sensation, or if someone has a serious reaction to a bite, they should consult a doctor. 5. What current projects are you working on? I am currently working to create a curriculum for local vectors (mosquitoes, ticks, yellow jackets), that reinforces the Next Generation Science Standards. We provide an education program to schools, and we are trying to make it interesting, useful and informative. We are also involved in a number of other projects including surveillance for invasive species of mosquitoes. Want to learn more about Eric Engh and mosquitos? Join us on Wednesday, October 11, 2017 at Terra Linda High School from 7:30 PM – 8:30 PM in Room 207!